Russia is a large country. Even after the fall of the Soviet Union, Russia’s area of 17 million square kilometers is almost double that of the US. But unlike United States it is disadvantaged when it comes to the parcel delivery service. In addition to Russian Post, a government owned inefficient organization, Russia has a number of private courier companies, but they all get expensive if the goods must be delivered to the door. For a working person, staying at home for the half a day waiting for a courier, and paying exact amount of purchase price in cash is inconvenient to say the least. According to Expert.ru, 30 percent of the shipping cost come are because of the “last mile” delivery. But the inconvenience is responsible to 45 percent of decisions not to purchase online, according to the source. This is where the postal terminal QIWI Post comes in: located in the popular locations such as train stations or shopping centers, the post box allows picking up delivery at any time and paying for it in cash without worrying about change. Here is how it works. A courier service delivers an online purchase to the buyer’s nearest post box terminal within two days. It is then placed in one of the 72 boxes of the terminal. The buyer receives an SMS notification that the item has been delivered and has a 5-day window to pay for it at the terminal in cash and pick the parcel up using a digital pin. Any change left will be deposited into QIWI wallet, an electronic payment tool actively used by 7.5 million people (total of 44 million have an account QIWI, according to Victoria Gracheva, the PR manager for iTech Capital). QIWI Post is a joint venture between Integer.pl (owner of InPost which has a similar business in Poland), QIWI and iTech Capital, a private equity and venture capital firm which has the founder and CEO of QIWI Andrey Romanenko as a co-founder and a limited partner. InPost has already installed 420 terminals and processed 3 million parcels in 2011. Together Integer.pl and iTech committed up to $30 million of investment in the company for the next three years, the payments will be processed by Integer.pl whilst QIWI offers its name, which for a long time has been associated with the only feasible option for Russians to pay for online purchases. In 2011 QIWI operated over 150 thousands terminals across Russia, as well as some eastern European and Asian countries. So when I spoke to the managing partner of iTech Capital Gleb Davidyuk, he confirmed that QIWI agent network will be deployed to expand QIWI Post outside of Moscow. It is interesting to see that QIWI is solving not only the number one problem of ecommerce business: online payments, but also the second biggest issue that is delivery. It is surprising however that QIWI did not offer both services from the beginning on, as they seem to fit together naturally. QIWI Post has a pilot project with 15 terminals in Moscow, but expects the number to reach 400 country-wide by the end of 2012. One of QIWI Post’s main competitors is Logibox. The company, which boasts Ozon.ru as its client, has had ambitious expansion plans in 2011, expecting a number of its terminals to grow to 500. Yet by the end of 2011 it only has only managed to install 80 terminals, but plans to grow to 1000 units in 2012. Equally ambitious were the LogiBox’s management intentions to raise $100 million venture investment, but in 2011 only between $2 and $4 million have been injected into the business. PickPoint is another player: by the end of 2011 the company had over 100 terminals, and planned to invest $13 million into the business. There are 2400 units in Germany, 1200 in the UK and 150 in Poland, but given the size of the Russia, so it is estimated to need 3000 to 6000 terminals to meet the need of the online and mail order customers. 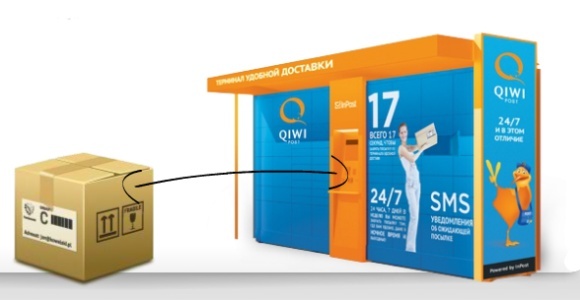 QIWI Post has strong competitive advantages to roll-out its service across Russia relatively quickly, given the size of the funds available, Polish know-how and QIWI’s network of the agents. Still it will take a while until the market will reach its saturation point. Russian ecommerce industry is set to profit the most.